The new café at Knowle West Health Park has proved so successful the owners are looking to open more café outlets in other parts of the city. Director Mike Merelie from commercial catering whizzkids Whisk! 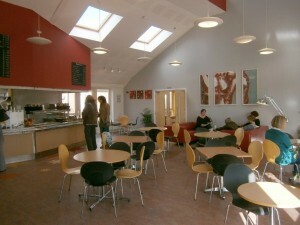 said the café had given the whole area a new lease of life. The café and the kitchens were mothballed two years ago following unsuccessful incarnations as a community café and training academy. Bristol-based Whisk stepped in to provide fresh, seasonal and delicious food seven days a week. Run by qualified chefs Evan Roberts and Mike Merelie, the kitchens provide a state-of-the-art hub for Whisk’s full range of business, conference, private function and wedding catering. Launched almost two years ago, Whisk had been operating from a range of locations across Bristol but had outgrown the temporary bases. Mike and Evan were impressed by the quality of the kitchen facilities at the health park. Mike Merelie said their stated aim of providing simple, tasty and good quality food at genuinely competitive prices had gone down very well with the Knowle West community. Knowle West Health Park helped pioneer community-based health care when it opened in 2000. The park’s current facilities include the William Budd Health Centre, a dialysis unit as well as the walk-in centre.